SAF marks 70th anniversary SAF – Southern Aluminum Finishing Co, Inc.
Atlanta, GA – July 21, 2016 – SAF (Southern Aluminum Finishing Co.), headquartered in Atlanta, GA, will mark its 70th anniversary this fall. At its founding in 1946, SAF was one of only two anodizing lines in the country. Founder Marvin McClatchey was a chemical engineer and pioneer in anodizing for architectural applications. Still in the family, SAF is currently led by second generation brothers and Co-CEOs, Penn McClatchey and Jim McClatchey. Early customers included commercial glazing contractors working to meet pressing demands for store front and curtain wall projects in the post WWII building boom. Since then SAF’s customer base has expanded internationally to include Construction Specifiers, Design-Build Contractors, Commercial Construction Subcontractors, Alternative Energy Product Manufacturers, Product Engineers, Automotive Suppliers along with Fabricators and Manufacturers in many other industries. A common thread is evident in a review of company milestones: a business acumen always directed toward providing products with more customer value and better quality that ship on time. In 1950 during the Korean war and an aluminum shortage, Alcoa invited SAF to accumulate scrap aluminum in return for a valuable flat sheet allocation. Soon after, SAF added aluminum sheet & extrusion distribution to its anodizing finishing services. SAF follows a growth plan to invest in resources whenever and wherever a strategic customer benefit can be identified to reduce logistical costs, time, and potential for shipping damage. In 1956 SAF added metal fabricating services with the purchase of an aluminum awning manufacturer driven to the brink by air conditioning. This resulted in single source ordering for aluminum anodizing, aluminum extrusions & sheet, and fabricating — wins for both customers and SAF. In 1968 after paint technology proved viable for architectural aluminum SAF began applying PVDF (aka Kynar® – a registered trademark of Arkema Inc ) paint coatings. Expanding its paint finishing services ten (10) years later in 1978, SAF commissioned a 20,000 sq ft, state of the art Fluoropolymer aluminum paint line. 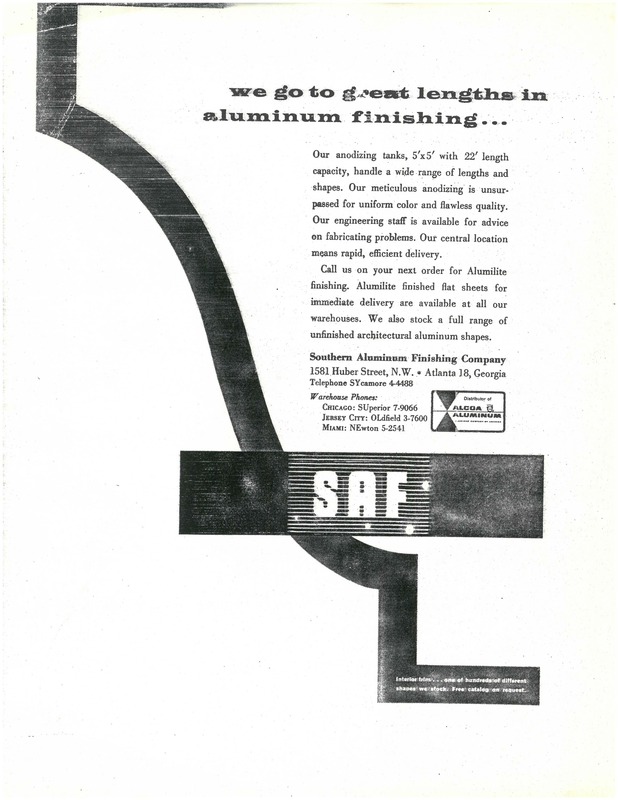 At this time SAF was among the first architectural fabricators in the US with an in-house aluminum paint line, offering customers another reliable aluminum finishing option with extensive color choices. In 1990 SAF entered the engineered architectural building products market by forming SAF Perimeter Systems Div. to manufacture innovative, custom commercial metal roof edge products, gutter & cornice systems. By 2011 the division had expanded its commercial Designer Series product offerings to include interchangeable extruded Cornice Mouldings, Gutters, Arch & Radius building trim systems in addition to entryway Pediment, Entablature and Column systems. In 1994 SAF secured a resource for volume anodized aluminum sheet production by purchasing an aluminum Coil Processing plant. SAF’s coil-anodizing line gives their sheet customers substantial cost-savings. The plant also enables SAF to offer toll coating and related aluminum coil processing services. SAF is currently one of a handful continuous aluminum coil anodizers in North America. Growing sales led SAF to acquire a 78,000 sq ft metal fabrication facility in 2003, expanding capacity for both SAF Metal Fabrication and SAF Perimeter Systems Divisions. To speed customer service in 2004 SAF inaugurated unique programs of “1 Day out” and “3 Day Out” turnaround times for qualified aluminum finishing and popular fabrication services. An industry first, customers were quick to respond with orders. In pre-recession 2008 SAF reported sales of $32MM, and they reached $38MM in 2016. The pace of SAF innovation quickened with the introduction of architectural building column covers (2004) and panel (2007) systems, BIM CAD services (2009), Perimeter Systems engineered product innovations and enhancements. The company’s most remarkable physical expansion began after the opening of their SAF-West branch in Redding, CA in 2007. In 2013 SAF commissioned an anodizing line in Redding, transforming SAF-West to become a full mirror of SAF Georgia operations. This provides customers nation-wide with strategic benefits in price and delivery for all SAF services, including aluminum finishing, aluminum distribution, and fabrication projects. In 2015 SAF employment nation-wide reached 300. Based in Atlanta, Georgia, SAF is a nation-wide aluminum extrusions and sheet distributor, metal fabricator, and aluminum finisher specializing in Kynar painting and architectural anodizing. SAF also distributes column covers, architectural panels, and commercial roofing trim to architectural specifiers, glazing contractors, and other industries. The SAF West serves Western US, Canada, and Pacific Rim markets.